Omron Microscan will demonstrate how its advanced verification and print quality inspection technology ensures 100% compliance of medical device manufacturers to the new European Regulations at the MDR & IVDR EU Conference in Orlando, FL on December 5-6, 2017. 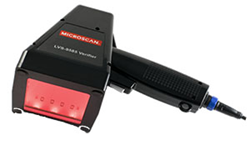 LVS-9585 Handheld Barcode Verifier for Direct Part Marks and printed labels is designed to be the best-in-class system to help medical device manufacturers comply with Unique Device Identification (UDI) requirements. Omron Microscan Systems, Inc., will be exhibiting at this year’s EU MDR & IVDR Conference in Orlando, FL on December 5-6, an event dedicated to guiding and training manufacturers affected by upcoming requirements for medical devices in Europe. The latest EU MDR & IVDR Regulations will modernize the medical device supply chain by improving transparency, introducing marking containing key information into medical devices and adding a new risk classification system for medical devices that perform in vitro diagnoses, among other things. As an industry-leading manufacturer of barcode scanning and verification equipment, Omron Microscan is well positioned to help impacted businesses comply with the new standards. Omron Microscan is a globally trusted leader in label verification solutions, and is well positioned to provide the technology needed to meet these new regulations, which are focused on improved transparency and traceability. Be sure to stop by the booth to see the new LVS-9585, a handheld verification system optimized for both printed labels and direct part markings. Designed to be the best-in-class system to help manufacturers comply with Unique Device Identification (UDI) requirements, the LVS-9585 accomplishes high-resolution inspection using software that automatically picks the best illumination settings from integrated red or white dome and 30° angle lighting. With track and tracing capabilities supporting 21 CFR Part 11 compliance, easy data export to SQL and other databases, advanced barcode defect diagnosis, convenient report generation and support of 15 languages, it is a powerful yet intuitive tool for helping meet EU MDR requirements. The LVS-9585 features as well as its ease of use ensures that new medical devices comply with the latest ISO and GS1 standards. In addition to the LVS-9585, Omron Microscan will be previewing a new version of the LVS-7510 printer that incorporates 100% in-line label print quality and barcode verification. Designed for use with the latest version of Zebra ZT600 series printers, an example of label management software integration with LVS-7510 will be shown by Innovatum, a partner of Omron Microscan and a leading labeling technology provider, whereby Robar Label Management Software provides a simplified and tightly integrated label inspection process. Like the LVS-9585, the upgraded LVS-7510 specifically targets a need shared by pharmaceutical, biotechnology and medical device manufacturers. EU MDR & IVDR Conference attendees will be privy to a demo of Omron Microscan LVS-7510 software integrated with Global Vision ScanProof that performs a complete check of a label inspection template against a reference image. There will also be an opportunity to learn more about how Omron Microscan services help manufacturers implement an IQ/OQ validation package for their verification systems. At the Innovatum booth, visitors will be able to see an example of direct integration of label print quality inspections with label design and management software. These many innovations serve to reassure manufacturers that for every new regulation introduced in Europe, there is a simple and easy way to meet the new standards. To schedule an appointment or live demonstration of the technology, please contact Omron Microscan here.